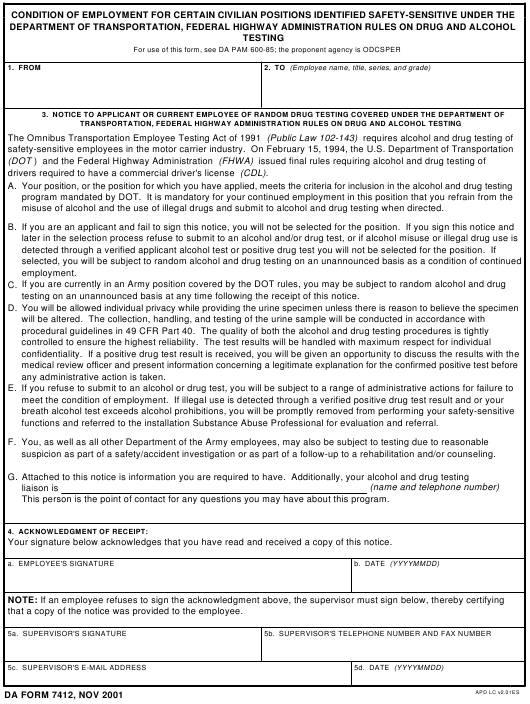 DA Form 7412 - also known as the "Condition Of Employment For Certain Civilian Positions Identified Safety-sensitive Under The Department Of Transportation, Federal Highway Administration Rules On Drug And Alcohol Testing" - is a United States Military form issued by the Department of the Army. The form - often mistakenly referred to as the DD form 7412 - was last revised on November 1, 2001. Download an up-to-date fillable PDF version of the DA 7412 down below or look it up on the Army Publishing Directorate website. drivers required to have a commercial driver's license (CDL). misuse of alcohol and the use of illegal drugs and submit to alcohol and drug testing when directed. testing on an unannounced basis at any time following the receipt of this notice. any administrative action is taken. functions and referred to the installation Substance Abuse Professional for evaluation and referral. suspicion as part of a safety/accident investigation or as part of a follow-up to a rehabilitation and/or counseling. This person is the point of contact for any questions you may have about this program. Your signature below acknowledges that you have read and received a copy of this notice. that a copy of the notice was provided to the employee.